Since Air Travelmax stopped operating, it's just SA Express flying from Johannesburg to Hoedspruit. To get a cheaper airfare (or at least to avoid a very expensive one), try be flexible with your dates and times. Alternatively, hire a car in Johannesburg and drive to Hoedspruit. 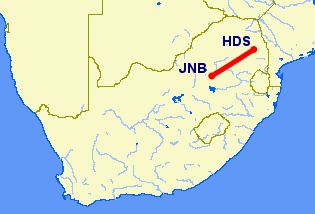 There are daily SA Express flights from Johannesburg Hoedspruit. Hoedspruit Airport is split into a commercial and a military section. The commercial section is called Eastgate Airport. As you come into land at Hoedspruit keep an eye out for the miliatary hangars. The terminal, if it can be called that, is a small single-storey building. 2011: Air Travelmax quits flying from Johannesburg Lanseria Airport to Hoedspruit (HDS). The Ashtons Kruger Shuttle offers a daily shuttle service between Johannesburg and Hoedspruit. From 9 Jul 2009, Premier Classe are operating an upmarket train service between Johannesburg & Hoedspruit. The train leaves Park Station Johannesburg on Thursday evenings and returns from Hoedspruit on Sunday evenings. The vast majority of tourists who fly to Hoedspruit do so to view the wildlife at the Kruger National Park. You can choose to stay at lodges like Londolozi and the Simbavati River Lodge.